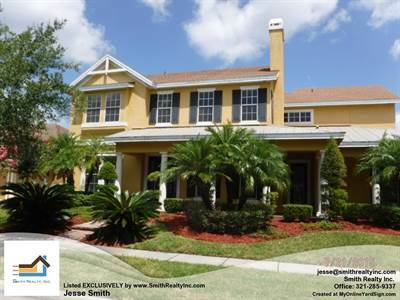 Avalon Park, Orlando - STUNNING CUSTOM HOME!!!! Looking for the WOW factor, this home has it. This custom 2 story corner home will make a statement with over 4600 square feet of space you will not be disappointed. Enter into a grand 2 story formal living area with fireplace as well as a custom built-in wine closet or serve a formal dinner in the dining area then relax in the great room with coffered trey ceilings leading to the pool area. The outside living space will inspire relaxation the cornet lot with views of neighborhood green space as well as a community pond. The pool and spa sit next to a stone gazebo as well as outdoor cooking space. Looking for some quality time don't forget the screening and media room with snack bar and bathroom. Centrally located in east Orlando just minutes to the 528, 417, 408 East/West, Research Park, Siemens, University of Central Florida, Valencia College, Medical City & Lake Nona Avalon Park offers its residents a great Live/Work /Play atmosphere. Orlando is most beautiful place and https://www.queensland-assignment.com/what-man-calls-civilization-always-results-in-deserts-man-is-never-on-the-square-he-uses-up-the-fat-and-greenery-of-the-earth-each-generation-wastes-a-little-more-of-the-future-with-greed/ also suggest people to purchase homes at this place. In Orlando people can get pool systems also around their homes. People can enjoy life in green areas of their homes.